We also learnt about various methods and algorithms for Object Detection where the some key points were identified for every object using different algorithms. In this tutorial we are going to use those algorithms to detect real life objects, here we would be using SIFT and ORB for the detection. Here object detection will be done using live webcam stream, so if it recognizes the object it would mention objet found. In the code the main part is played by the function which is called as SIFT detector, most of the processing is done by this function. And in the other half of the code, we are starting with opening the webcam stream, then load the image template, i.e. the reference image, that is the programme is actually looking through the webcam stream. Next, we are continuously capturing the images from the webcam stream with the help of infinite while loop, and then capturing the corresponding height and width of the webcam frame, and after then define the parameters of the region of interest (ROI) box in which our object can fit in by taking the corresponding height and width of the webcam frame. And then we draw the rectangle from the ROI parameters that we had defined above. Then finally crop the rectangle out and feed it into the SWIFT detector part of the code. Now the SIFT detector basically have two inputs, one is the cropped image and the other is the image template that we previously defined and then it gives us some matches, so matches are basically the number of objects or keypoints which are similar in the cropped image and the target image. Then we define a threshold value for the matches, if the matches value is greater than the threshold, we put image found on our screen with green color of ROI rectangle. Now let’s move back to the main part of the code, the function which is called as SIFT detector, it takes the input as two images one is the image where it is looking for the object and other is the object which we are trying to match to (image template). Then gray scale the first image and define the image template as second image. Then we create a SIFT detector object and run the OpenCV SIFT detect and compute function, so as to detect the keypoints and compute the descriptors, descriptors are basically the vectors which stores the information about the keypoints, and it’s really important as we do the matching between the descriptors of the images. And then define the FLANN based matcher, we are not going into the mathematical theory of matching behind it, but you can easily Google about it. Firstly, define the index kdtree to zero and then we set the index and search parameters in the dictionary format, we just define the algorithm we are going to use which is KDTREE, and the number of trees we are going to use, the more tree we use the more complicated it gets and slower. And in search parameter define the number of checks, which is basically number of matches it’s going to complete. And then create our FLANN based matcher object by loading the parameter we previously defined which are index parameters and search parameters and based upon this create our FLANN based matcher, which is a KNN matcher where KNN is K-nearest neighbors, basically it’s a way where we look for nearest matchers and descriptors and we do the matching with initialization constant k. Now this FLANN based matcher returns the number of matches we get. FLANN based matching is just an approximation, so as to increase the accuracy of the FLANN based matcher we perform a Lowe’s ratio test and what it does is it looks for the matches from the knn flann based matcher and define some matric parameters which is distance here, for which distance is a numpy function, and once it meets the criteria append the matches to the good matches and returns the good matches found, and so the live video stream tells the number of matches found at the corner of the screen. Object detection using SIFT is pretty much cool and accurate, since it generates a much accurate number of matches based on keypoints, however its patented and that makes it hard for using it for the commercial applications, the other way out for that is the ORB algorithm for object detection. Similar to the method of object detection by SIFT in which we divided the programme into two parts, the same will be followed here. Firstly, we define the function ORB_detector which takes two inputs one is the live stream image coming from webcam and other is the image template on the basis of which we are going to match our image. Then we grayscale our webcam image and then initialize our ORB detector, and we are setting it here at 1000 key points and scaling parameters of 1.2. you can easily play around with these parameters, then detect the keypoints (kp) and descriptors (des) for both the images and the second parameter we are defining in detectANDCompute function is NONE, it is asking for the use of image mask or not and we are denying it here. Then move to the detector previously we have been using FLANN based matcher, but here we will be using BFMatcher and inside BFMatcher we define two parameters one is NORM_HAMMING and other is the crossCheck whose value is TRUE. Then compute the matches the matches between those two images using the descriptors defined above, which in all returns the number of matches since these matches are not approximation and hence there is no need to do Lowe’s ratio test, instead we sort the matches based upon distance, least the distance more the match is better (here the distance means distance between the points), and at the end we return the number of matches using length function. And in the main function we set the threshold to a much higher value, since orb detector generates much of noise. Now let’s talk about a different descriptor which is Histogram of Oriented Gradients (HOG’s). HOG’s are pretty much cool and useful descriptors and they are widely and successfully used for object detection, as seen previously the image descriptors like SIFT and ORB where we have to compute keypoints and then have to compute descriptors out of those keypoints, HOG’s do that process differently. It represents objects as a single feature vector as opposed to a set of feature vectors where each represents a segment of the image. It means we have single vector feature for the entire image. It’s computed by a sliding window detector over an image, where a HOG descriptor is a computed for each position. And then each position is combined for a single feature vector. Like SIFT the scale of the image is adjusted by pyramiding. Previously we have used matchers like FLANN and BFMatcher, but HOGs do it differently with the help of SVM (support vector machine) classifiers, where each HOG descriptor that is computed is fed to a SVM classifier to determine if the object was found or not. Understanding HOG’s could be quite complex, but here we are only going to deal with the theory of HOG’s without going deeper into the mathematics related to it. So let’s take this picture it’s a little pixelated a bit, and on the upper corner is 8x8 pixel box here, so in this box we compute the gradient vector or edge orientations at each pixel. So it means in this box we calculate the image gradient vector of pixels inside the box (they are sort of direction or flow of the image intensity itself), and this generates 64 (8 x 8) gradient vectors which are then represented as a histogram. So imagine a histogram which represents each gradient vector. So if all the points or intensities lied in one direction, the histogram for that direction let’s say 45 degrees, the histogram would have peak at 45 degrees. So what we do now is we split each cell into angular bins, where each bin corresponds to a gradient direction (e.g. x, y). In the Dalal and Triggs paper, they used 9 bins0-180° (20° each bin). This effectively reduces 64 vectors to just 9 values. So what we have done is reduced the size but kept all the key information which is needed. Next step in calculating the hog’s is the normalization, we normalize the gradients to ensure invariance to illumination changes i.e. Brightness and Contrast. We divide the vectors by the gradient magnitudes we get 0.707 for all, this is normalization. Similarly, if we change the intensity or change the contrast we get the below values. Normalization doesn’t take place on a cell level, instead it takes place in a block level, so here the blocks are basically a group of 4 cells, this takes into account neighboring blocks so normalize while taking into consideration larger segments of the image. # We index blocks by rows first. # for each cell of its group for each group. Indexing is by rows then columns. The image shows how the input image is represented as HOG representation. As previously discussed, we can extract features from an image and use those features to classify or detect objects. What are HAAR Cascade Classifiers? An object detection method that inputs Haar features into a series of classifiers (cascade) to identify objects in an image. They are trained to identify one type of object, however, we can use several of them in parallel e.g. detecting eyes and faces together. negative images (i.e. images without the object present). Once we have those images, we then extract features using sliding windows of rectangular blocks. These features (HAAR features) are single valued and are calculated by subtracting the sum of pixel intensities under the white rectangles from the black rectangles. However, this is a ridiculous number of calculations, even for a base window of 24 x 24 pixels (180,000 features generated). So the researchers devised a method called Integral Images that computed this with four array references. However, they still had 180,000 features and the majority of them added no real value. Boosting was then used to determine the most informative features, with Freund & Schapire’s AdaBoost and it found most informative features in the image. Boosting is the process by which we use weak classifiers to build strong classifiers, simply by assigning heavier weighted penalties on incorrect classifications. Reducing the 180,000 features to 6000, which is still quite a bit features. In those 6000 features, some will be more informative than others. So if we used the most informative features to first check whether the region can potentially have a face (false positives will be no big deal). Doing so eliminates the need for calculating all 6000 features at once. This concept is called the Cascade of Classifiers - for face detection, the Viola Jones method used 38 stages. So after gaining some theoretical knowledge about the HAAR cascades we are going to finally implement it, so as to make things pretty much clear we will break the lessons in parts, first we would detect frontal face after that we will move to detect frontal face with eyes and finally we would do live detection of face and eyes through the webcam. So for this we are going to use pre-trained classifiers that have been provided by OpenCV as .xml files, xml stands for extensible markup language, this language is used to store vast amount of data, you could even build a database on it. You can have the access of these classifiers at this link. Let’s try for the frontal face detection, you can have the access for the cascade of frontal face detector here. Just extract the zip file to get the xml file. # it returns the list of lists, which are the location of different faces detected. Now let’s combine the face and eye detection together, you can have the access for the cascade of eye detector in the same zip file. So this code is same as much as that the code for the face detection, but here we have added eye cascades and method to detect them, as you can see we have chosen the Gray scaled version of the face as the parameter for the detectMultiScale for the eyes, which brings us to the reduction in computation as we are only going to detect eyes only in that area only. So till now we have done face and eye detection, now let’s implement the same with the live video stream from the webcam. In this we will do the same detection of face and eyes but this time we will be doing it for the live stream form the webcam. In most of the application you would find your face highlighted with a box around it, but here we have done something differently that you would find your face cropped out and eyes would identify in that only. Scale Factor Specifies how much we reduce the image size each time we scale. E.g. in face detection we typically use 1.3. This means we reduce the image by 30% each time it’s scaled. Smaller values, like 1.05 will take longer to compute, but will increase the rate of detection. Min Neighbors Specifies the number of neighbors each potential window should have in order to consider it a positive detection. Typically set between 3-6. It acts as sensitivity setting, low values will sometimes detect multiples faces over a single face. High values will ensure less false positives, but you may miss some faces. To find out where you python.exe is installed, just run these two lines of code, it would print the location where python is installed. You can have the cascade for pedestrian detection and from the zip file attached here. 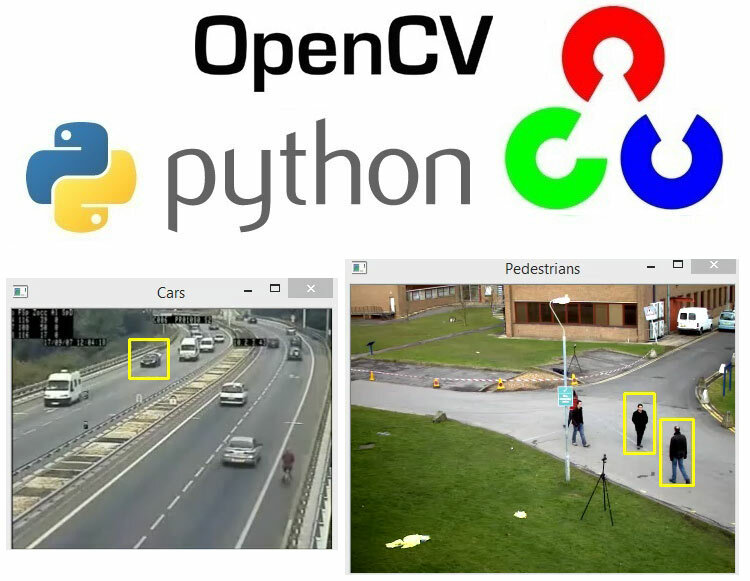 After successfully detecting pedestrian in video, let’s move to the code for Car detection, You can have the cascade for pedestrian detection from here. You have noticed that we have added time.sleep(.05), it’s just a delay in frame rate so you can confirm that all the cars are correctly identified, or you can easily remove it just by adding a comment label to it.